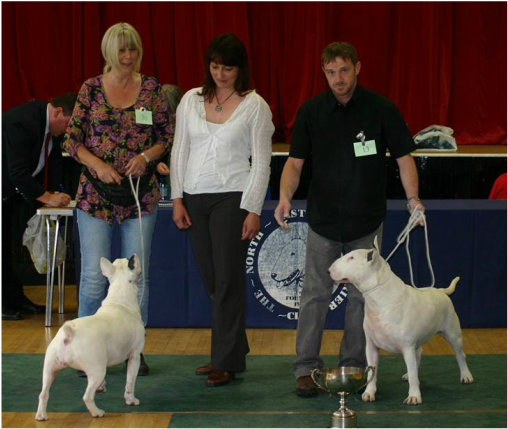 I would like to thank the committee of the North East Bull Terrier Club for inviting me to judge their open show and their generous hospitality on the day. I would also like to thank the exhibitors for showing under me and a special thanks to the steward who kept the ring running smoothly. All exhibits were presented in gleaming condition and I was very pleased with my winners. 8 month old solid red boy, Nice terrier type with sweeping profile, short back with good straight front. Sadly unable to assess his mouth or movement as he became very unsettled in the ring from this point on. Very smart, well marked red and white boy, correct scissor bite and canines. Sweeping profile with good eye and ear set giving a keen expression. Short back with good topline, front and bend of stifle. Nice bone for size and more to come as he matures. Classically marked black brindle boy, nicely constructed with correct mouth, pleasing profile with good width and used his ears well. Good fore chest with straight clean forelegs, level topline with short back. Moved out well fore close to rear. Well handled. Pushed hard in line up. Red and white boy, mouth incorrect but with a lovely sweeping profile and saucy expression. Kept his topline on the move but moved wide on the front and close behind. Again, well handled. 8 year old proper heavyweight of a type you rarely see these days. Bags of bone and substance, adequate profile with big wide deep head with tiniest eye. Mouth just off which is common at his age. Nice front and good bend of stifle. Moved with a delightful jaunty air up and down the ring. Pleasure to go over. Eye catching super headed tri girl. Smartly marked and up on her toes showing well for her handler. Mouth incorrect but lovely well constructed bodylines and a very nice parallel movement. White with brindle ears, heavyweight type than winner, good mouth, pleasing profile and moved out well. Super headed white with black ear, Deep headed with nice fill and strong profile. Mouth ok, Straight front with wide fore chest and neat feet. Compact bodylines although would prefer a better muscled tone to complete the picture. Moved better coming that going away. Shown well.